HOUSTON (KTRK) -- If you recognize the guy in these photos, you could be eligible for a reward of up to $5,000. He's a suspect in an aggravated robbery in southeast Houston. These images are from May 22 a little before 11am. The suspect walked into a restaurant in the 9200 block of the Gulf Freeway, posing as a customer. Police say the suspect ordered a sandwich, then pulled out a gun. He reportedly demanded cash from the register. The employee complied and the suspect took off on foot. 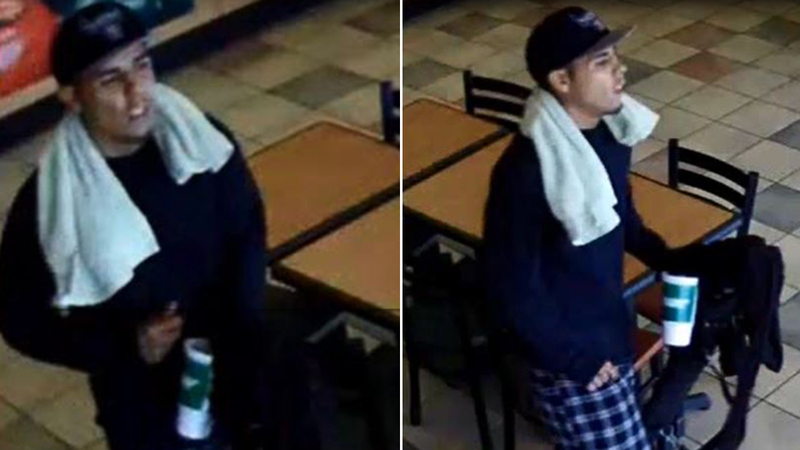 The suspect is described as an Hispanic male, 18 to 20 years old, standing between 5 feet 2 inches to 5 feet, 4 inches tall and weighing approximately 130 to 140 pounds with black hair. Crime Stoppers will pay a reward of up to $5,000 for information leading to the charging and/or arrest of the suspect or suspects in this case. Information may be reported by calling 713-222-TIPS (8477) or submitted online at www.crime-stoppers.org.